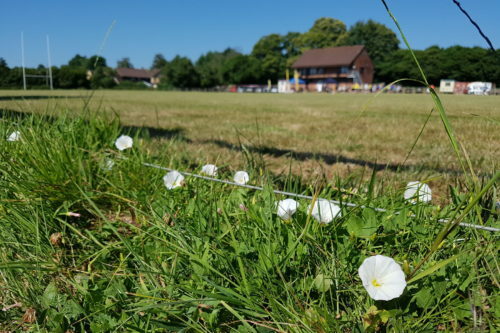 During the 2018 AGM, it was suggested that we should survey neighbourhood greens and pitches. I am doing some of my local green areas including Uckfield Rugby Club. This is a splendid community facility that is sandwiched between the estate where I live and the River Uck. It also borders onto ancient woodland. Before the playing fields were created, just over 50 years ago, it was a hop field. It is suggested that woodland edge is important for all sorts of species. The boundary of the rugby field is, in effect, a man-made woodland edge. On my April visit, while surveying the un-mown strip at the edge by the ancient woodland, I found bluebells, wood anemones and a variety of trees and shrubs. While studying these I noticed birds, including a pair of green woodpeckers, moving between the woodland trees and the grass. In July there were some very attractive grasses that, left to grow undisturbed, were nearly as tall as I am. 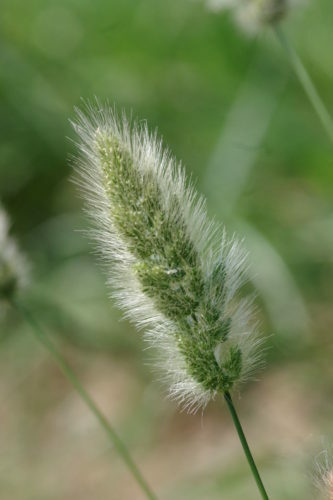 My favourite was Schedonorus giganteus (Giant Fescue) with its black “knees and ears”. However, it was on a heap of soil, trodden into a miniature hill and partly grown over, that I encountered something a bit more surprising. I found a pretty little grass with a very fluffy head. Having scoured my books and keys, I decided it was Polypogon monspeliensis (Annual Beard Grass). I looked it up in my lovely new Flora of Sussex … and … oh dear. No sign of it near Uckfield. However, when I checked the ID in the Facebook group it was OK, so into the spreadsheet and off to Matthew it went.